What is it: An automatic brow pencil with a unique slant tip for ultra-precise definition, plus 16-hour wear that's sweat- and humidity-resistant and waterproof. Formulated with a combination of waxes and emollients, this long-wearing formula won't smudge or fade, so brows look fresh and polished. Who is it for: Anyone who wants defined, well-groomed brows that last for 16 hours. Why is it different: The slant tip offers the ultimate customized and versatile application-use the flat edge for a softer look and the pointed tip for a more defined, bold look. A wax-based formula creates a lasting, waterproof and sweat- and humidity-resistant layer of color. The attached brush lets you comb brow hairs into place, for a look that's flawless and natural. Available in a uniquely wide range of shades, so every woman can find the right shade for her skin tone and hair color. How do I use it: Use the flat side of the pencil to shape the beginning of the brow and the pointed tip to define the edges of the brow. 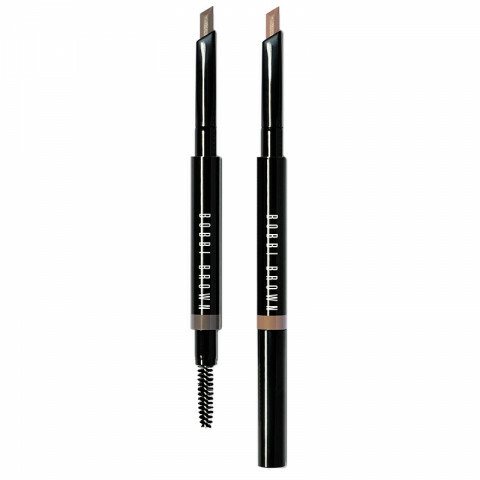 For a bold, super-defined look, use the pointed tip to define the length of the brow. Comb brow hairs into place using the attached brush. It is so easy to use, has a variety of colours and is really handy dandy to pop in your purse for a quick fix! this is one of the best eye pencils i have tried and i will be ordering another one. I appreciate the ease of use this has and how it's easy to travel with. I usually use Anastasia brow products but this one is worth looking into too. Similar to the Anastasia brow definer.